It's the Bootie LA Prom! Your favorite mashup party celebrates Prom season by throwing "a Prom for the rest of us!" Come as you are or dress up in creative Prom attire for a chance to be crowned the Bootie Prom King, Queen, or Best Couple at midnight! $100 ca$h prize$! Only $5 before 10 PM! Come as you are or dress up in creative Prom attire to win Prom King, Prom Queen, or Best Couple. Contest atmidnight! $100 ca$h prize$! Bootie LA celebrates Prom season with “a Prom for the rest of us!” Dress up in creative Prom attire for a chance to win $100 cash prizes, with you, the Class of 2016, deciding the winners! 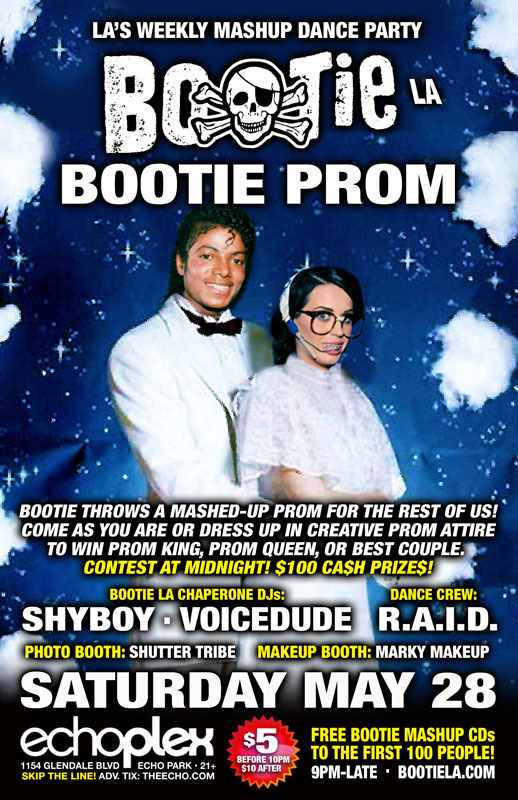 Your chaperones for the evening will be Bootie LA resident DJs ShyBoy and Voicedude, as they play all your old and new favorite mashups, with Prom mashups thrown into the mix! Resident dance crew R.A.I.D. will be on hand to fill the stage with their Prom-tastic go-go insanity, Shutter Tribe will be there to capture you in all your Prom finery, and Marky Makeup gives your bodies some extra prom glamour! All this plus FREE Bootie mashup CDs for the first 100 people through the door!